Being a stealth coder is something akin to being a Systems Administrator. As long as everything works, no one credits or cares about what you do, but if something goes wrong, you’re scape goat number one. And if you then fix whatever problem there was, you immediately go back to being invisible to mere mortals again. 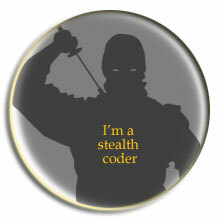 Stealth coders come from a long line of ninjas, and has carried on that tradition with proudness and a high head. It’s not the fame or recognition you do it for, it’s for the work itself. You place a lot more value in doing your trade as best as humanly possible and take only comfort in sheer quality. I’m a stealth coder and I’m proud of it. For those of you who want to be able to connect with your peers or express your pride in your own personal (never visited) web site, I’ve created a button for you to display. But remember, if you place this button in your web site, you may not, under any circumstances, link back here, since it would go against the very nature of being a stealth coder. haha I'm descended from a long line of Vikings like you I expect (my mother is Norwegian – her father Kittles Tronerud jumped ship in Australia at 19)… what we have is a tendency to like alcohol, be fascinated with nuns and any girl who is running away, and a tendency to yell occasionally whilst wealding a double sided axe! Between this post and your recent DOMAssistant post, I'm presuming that you're feeling unappreciated these days. I can relate as my position and station seems similar to yours. For what it's worth, I read your blog regularly through RSS and find the posts interesting, and the tech talk and code samples very useful. To this day, I regularly use your (modified) getElementsByClassName in various Ajax web projects. So, you may be a stealth coder, but your work has not gone unnoticed, at least by other "ninjas". Ah, I'm sorry, I threw away my editing file. The picture I have here is all I've got. Thank you! For your kind words and that you use some of my code. I exactly know what you are talking about, Robert. At least I have a got a few colleagues with whom (is that correct english?!) i share the same addiction for our beloved profession. And sometimes, yes, sometimes you even get back a little respect and appreciation from people, which usually only see your errors.